The movie Harold And Kumar 2: trailer, clips, photos, soundtrack, news and much more! Harold an Kumar: Escape From Guantanamo Bay is going to be officially released this week. I think that Neil Patrick Harris deserves his own movie! 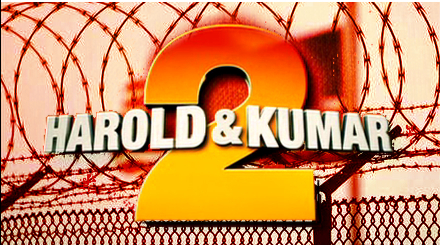 Why releasing so many preview clips of Harold and Kuma 2, aka Harold and Kumar Escape from Guantanamo bay! Well, let’s hope the marketing team of this movie isn’t spoiling the plot too much, and that there will still be be some surprises kept for us. The clip with the KKK meeting is kind of funny. But the one with the Redneck isn’t as much funny. Fortunately Doctor Doogie Howser, er, I mean Neil Patick Harris, is here to give a better image of white people! Ron Fox (Rob Corddry) gets his first look at Harold (John Cho) and Kumar (Kal Penn). Crazy Doctor Doogie (Neil Patrick Harris)! Harold and Kumar escape from Guantanamo bay! Funny how people evolve in their life! Harold or Kumar? Who is crazier?